For those who might not know, May 16th through May 22nd marks American Craft Brew Week. So definitely go out and have a pint of your favorite non-macro brew, i.e. any beer that does not have a TV commercial spot running nationally. Personally, I am going to find a Rogue Shakespeare Stout, even though this is not the season for it at all. Or, if possible, I will enjoy a Victory Hop Devil IPA. I actually came to the craft beer world in a roundabout way. My wife is a sales rep for a large Mid-Western alcohol distributor and a beer enthusiast/blogger. (Not to shill too much, but I highly recommend checking out her blog kimandtonic.com.) While we were still dating, she told me that I passed her initial test by not ordering what she terms “yellow fizzy water” when we went to the bar. I can honestly claim that I married into a beer family. Not only does my wife have a near encyclopedic knowledge of all things beer (she can explain the difference between the IBU and ABV of a beer), but my father-in-law is a home brewer. Currently he has a home brewed bourbon porter on tap that is excellent. So in keeping with the theme of this blog, tying what is happening today to some aspect of Renaissance England, I am devoting this post to the 17th century’s most controversial brewer, Oliver Cromwell. Yes, a little known fact about the Lord Protector is that he came from a family of brewers. 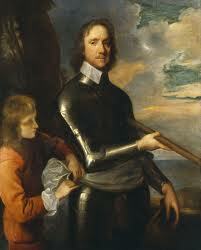 Now historians/biographers are divided on how to understand Oliver Cromwell. On the one hand, there is the picture of probably one of the greatest military leaders that England has ever had, and one of his greatest contributions to the modern military was the New Model Army. 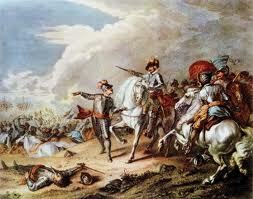 In 1645 the Parliamentary forces were losing the English Civil war to the Royalist army. It was thought, particularly by Cromwell, that Parliamentarians’ failure in the battle field was due to the fact that MPs could actually serve as army officers. As he stated to Parliament: “I do conceive if the Army be put into another method, and the War more vigorously prosecuted, the People can bear the War no longer, and will enforce you to dishonorable peace.” For Cromwell, there was a conflict of interest between those in Parliament who wished to prolong the war and those in the army who wanted a swift victory. So out of this controversy came the Self-Denying Ordinance, which prohibited any MPs from serving as army commanders. In addition, this legislation allowed for the formation of a new type of army, one that would be better disciplined, drilled, and paid. Most importantly, though, this new army stressed uniformity. Prior, English armies had been a hodge-podge of armed militias from various parts of the country, and often local affiliation trumped national identity. The New Model Army stressed uniformity, having its members dress in the same uniform, the red coat being the predominant feature of the attire. (This is where the nickname “Red Coats” came for the British Army.) At any rate, Cromwell served as the Lieutant-General of the cavalry. At the battle of Naseby on June 13th 1645 the New Model Army proved its mettle, delivering a disastrous blow to Charles I’s forces. While a great military leader, Cromwell proved to be impatient with due political process. Having defeated Charles I in the first part of the English Civil War, the army was once again growing restless with Parliament. Here’s what happened: in 1646, Charles I had been captured by Parliamentary forces. For the next three years he would be imprisoned, during which time he nearly escaped once, was moved to the Isle of Wight (pronounced “wait”), and held secret correspondence with the Scots. Many army officers wanted a speedier resolution to the matter, so in 1648, Col. Thomas Pride staged essentially a military coup d’état and purged Parliament of those unwilling to move forward with actions against the King, all done under the approval of Henry Ireton (Cromwell’s son-in-law) and Cromwell himself. This would not be the last time that Cromwell would use the military to exert his will on Parliament when they did not move fast enough for him. In 1653 he would actually force out of Westminster those MPs who still remained from Pride’s Purge (these MPs made up what is known as the Rump Parliament), telling them they had sat too long. To give the pretense of a representative form of government, Cromwell formed the “Bare Bones” Parliament, essentially his cronies. In this year, Cromwell took the title of Lord Protector, which was the name for the position of the one who governed in the monarch’s stead when s/he was not of age. Historians and biographers debate whether this is evidence of his own ambitions to be king. The last thing I want to discuss is Cromwell’s massacring of the Irish at Drogheda and Wexford in September and October 1649. Back in 1641, there was an Irish uprising against the English plantation owners. (What a surprise, when you systematically push people of their homeland they don’t take it well.) Anyway, the reports of the uprising where greatly exaggerated in England – the Irish rebels were said to have killed pregnant women and put English babies on pikes! Hi, thanks for taking time to stop by my blog, Renaissnace Matters. So here's a little bit about me . . . I am student, scholar, reader, writer, teacher, and general enthusiast about the European Renaissance, a.k.a the Early Modern period. In May 2010, I graduated with my doctorate in English Literature from Lehigh University, focusing my dissertation on the literary reaction to the Scientific Revolution. I currently have an article in the recent issue of Early English Studies (EES). Also, keep an eye out for my forthcoming book through Palgrave MacMillan, Francis Bacon and the 17th-Century Intellectual Discourse. This entry was posted in Why the Renaissance matters and tagged Beer, Drogheda, Interregnum, Irish, Irish Uprising 1641, Massacre, New Model Army, Oliver Cromwell, Pride's Purge, Puritan, Rump Parliament. Bookmark the permalink. Really excited that you think so. Thanks so much. I make sure to up date the blog weekly, sometime bi-weekly. Also, please let me know if you have any burning questions about the Renaissance. i would love to devote a post to them.